Above: The famous horse race of Siena, the “Palio di Siena,” held every year in early July and mid-August (image via WikiSiena). If you’re anything like us, you’re probably Googling around the internet looking for information and updates on the Palio di Siena to be run on Friday, August 16. 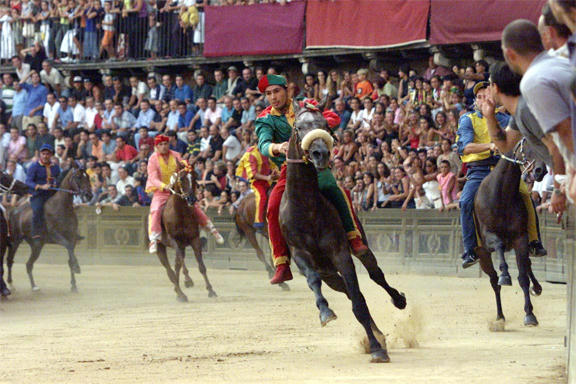 We recently came across a wonderful online description of the Palio at WikiSiena (probably the best English-language resource for all things “Siena” that we’ve ever seen). The Palio is the most important event in Siena and it has involved the life of Sienese people over time and in many different aspects and feelings: “You run the Palio all year long”, someone says. It is a horse race run in Piazza del Campo and it was born long time ago (the earliest known antecedents of the race are medieval and some present day regulations are still valid since 1644, when it was run the first Palio with horses, as it is run today). It is held on July 2nd (named Palio di Provenzano, in honour of Madonna of Provenzano) and August 16th (named Palio dell’Assunta, in honour of the Assumption of Mary) and it is run by 10 of the 17 Contrade (city wards) that form the city. Each Contrada is like a small state, ruled by a Seat headed by the Prior and led in the “carousel” by a Captain, assisted by two or three contradaioli called “Mangini”; their boundaries was established in 1729 by Proclamation of Violante of Bavaria, Governor of the City. As we gear up for the Palio dell’Assunta this Friday, we’ll be following some of the Italian-language sites that document the events every year (like SienaFree.it; if you do read Italian, have a look at this detailed post, including information on how to attend the events). And we’ll post the winning contrada and its flag on Friday. But in the meantime, if you want to read up on this wonderful, historic pageant, take a look a this entry from WikiSiena. This entry was posted on August 13, 2013 by Terlato Media. It was filed under CELEBRATE LIKE AN ITALIAN, TRAVEL LIKE AN ITALIAN .